Thank you, Miryam. This looks delicious, but I cannot eat. My heart is broken for uncle Laban. Remember last month, when old Lehi dreamed Jerusalem would be destroyed for the people’s wickedness … and then disappeared with his whole family. One day business as usual, and the next day, gone. We feared the worst. Why would Lehi disappear without settling his affairs? He had to know what this would do to Laban. 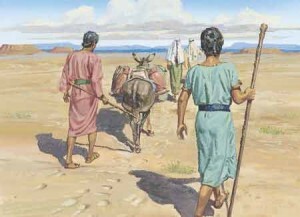 They weren’t just friends … Lehi was in charge of our Phoenician account and if we lose them, we lose everything. 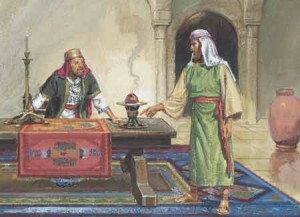 And now we find out he borrowed an enormous sum of shekels from the West Bank to pay for the frankincense shipment, right before he vanished. So no one has seen Lehi for weeks. 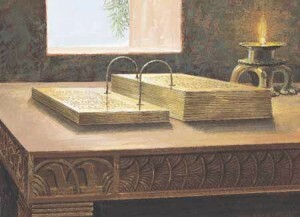 But a few days ago his son, Laman, walks in like he owns the place and says his father wants the brass plates … you know, the ones engraved with the Torah, that Laban commissioned for the Temple of Solomon. Laban was stunned. Are you mad? he says. Your family leaves me high and dry, on the verge of bankruptcy, with the Phoenicians and West Bankers breathing down my neck … and now you want the brass plates, the only book of its kind, my gift to the Temple? What’s going on? Where’s Lehi? Laman refused to answer so Laban showed him the door. But the next day … and you may find this hard to believe … Laman returned with his brothers and a cartload of ‘treasures’ to trade for the brass plates. It was embarrassing. They thought a load of furniture, a few old lamps and some dusty goods from the back of the warehouse would buy a priceless Torah. Laban threw them out. 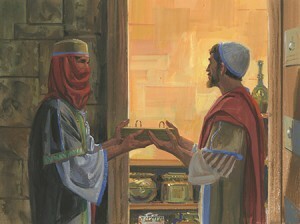 And he put all their goods in the storeroom until we can find Lehi and tell him what his sons are up to. But that isn’t the worst of it. Last night, after we left Laban and Rachel’s anniversary party, an assassin sneaked past the guards and jumped the wall to find Laban passed out in the courtyard. 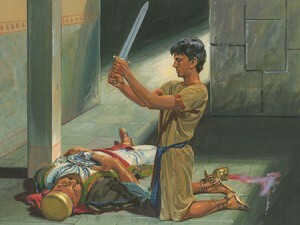 Taking Laban’s own sword, he cut off Laban’s head and stripped him naked. 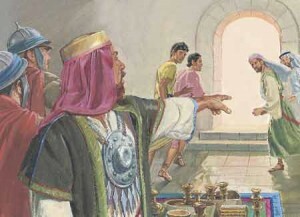 Then, wearing Laban’s bloody clothes, the assassin bluffed his way into the treasury, stole the plates of brass and kidnapped Laban’s most trusted servant. And thus was our house brought down into the dust. Laban was like a father to me. He raised our family from poverty and named me his scribe. 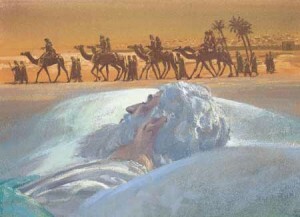 And now he is dead, his legacy in ruins, his beloved Rachel in mourning. Everything he built, destroyed by assassins with no regard for God, temple or the holy scriptures they stole. So, tear your robe and sing the Kaddish, my lovely. I leave at once to join the search party and bring Laman and his brothers to justice. God help them if they’ve done anything to Lehi and Sariah.